Hall of Fame Team - Play as your favorite players from the past like Nolan Ryan, Reggie Jackson and Yogi Berra. 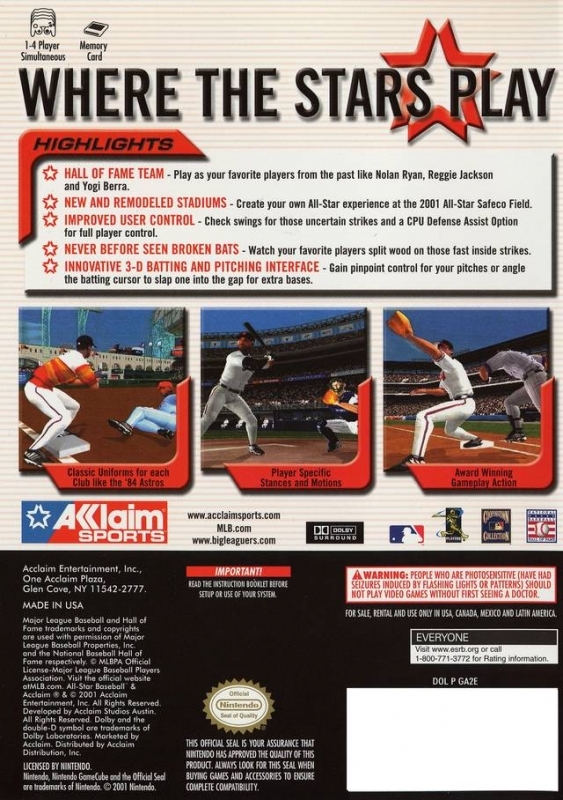 New and Remodeled Stadiums - Create your own All-Star experience at the 2001 All-Star Safeco Field. Improved User Control - Check swings for those uncertain strikes and a CPU Defense Assist Option for full player control. Never Before Seen Broken Bats - Watch your favorite players split wood on those fast inside strikes. Innovative 3-D Batting and Pitching Interface - Gain pinpoint control for your pitches or angle the batting cursor to slap one into the gab for extra bases.